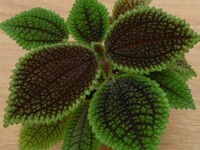 Very heavily textured, and quilted, bright green leaves with serrated edges. Leaves are covered with varying amounts of chocolate brown color from just the veins to most of the leaf at times. Pinch regularly to encourage small shrub-like growth. 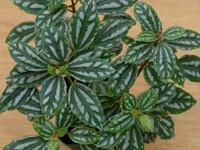 Great for windowsill or Lightstand! Prefers bright light, but no direct sun. Attractive! 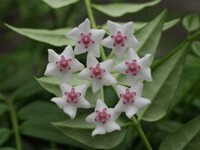 Hoya plants are some of the easiest plants to grow. 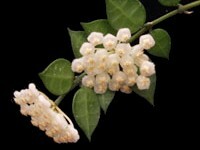 Nicknamed "The wax plant". They do very well in hanging baskets both indoors and out. Hoyas like bright light, but not direct sun. This variety is one of the best, and showiest! This variety is very cute! It is compact growing, compared to Hoya bella above. This one has an added bonus of being fragrant. Tiny little clusters of creamy yellow flowers. Prefers bright light, but no direct sun. Also nice in a small hanging basket.